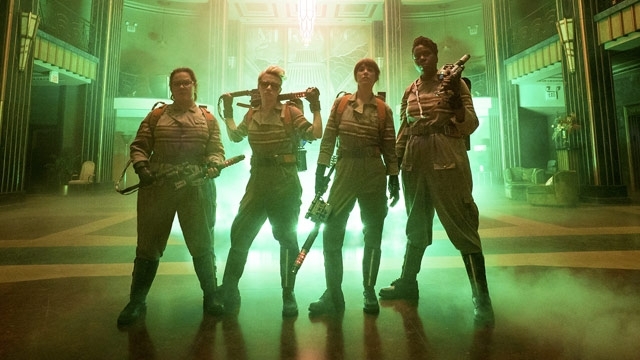 Ever since it was first announced, the 2016 Ghostbusters movie has been at the epicenter of a ton of publicity: some positive, some negative, but most of it revolving around whether or not four women could bust ghosts as well as the original four guys. The short answer is: Yes, they can. While there’s no denying that the original film had a special something that can never be duplicated, Paul Feig’s 2016 franchise reboot is a silly and entertaining blockbuster for a new generation, one that’s chock-full of nostalgic fan service. Erin (Kristen Wiig), a charmingly awkward professor at Columbia University, has her dreams of tenure dashed when her former research partner and estranged childhood friend Abby (Melissa McCarthy) republishes a book about paranormal activity that the two co-wrote years earlier. Although Erin initially wants her to take the book out of circulation, the two make up after they stumble upon a real-life haunting. Meanwhile, Abby’s new partner, eccentric scientist Jillian Holtzmann (the absolutely fantastic and show-stealing Kate McKinnon), develops some complicated and crazy-looking spook-catching gear, which comes with plenty of entertaining technobabble. After landing final recruit Patty (Leslie Jones), a sharp-witted former New York subway employee who has experienced some paranormal action of her own, the ladies decide to set up shop and start catching ghosts, and they hire the super-attractive (yet super-dumb) Kevin (Chris Hemsworth) to be their secretary. Things get complicated for the four friends in the wake of a series of ghostly appearances around New York City, all of which lead back to a mysterious weirdo (Neil Casey) with less-than-savory intentions involving the spectral plane. The film’s plot is nothing original—it mirrors its 1984 predecessor almost entirely—but then again, originality isn’t what an audience is looking for in a reboot. And with Paul Feig (Bridesmaids, The Heat) at the helm, there’s no shortage of laughs. The terrific cast and modern-day twists make this story feel fun and somewhat fresh (for example: social-media posts and YouTube videos of the paranormal encounters). Adding to the nostalgia are highly amusing cameos from most of the cast members of the original Ghostbusters (yes, including everyone’s favorite ghosts, all of whom show up in one form or another). The new ghouls are fun, the CGI-enhanced homages pay tribute to the Ghostbusters cartoon and the aesthetic of the first film, and of course, there’s more than enough gooey, green ectoplasm to go around. At times, the characters nearly break the fourth wall: Erin and Abby read comments on a YouTube video that decry the plausibility of female Ghostbusters, a joke that feels just meta enough. The comedic chemistry between the four new Ghostbusters is palpable, making for a hysterical and believable group of specter-fighting friends. What’s more, it’s refreshing to see a group of onscreen female pals who aren’t just discussing their love interests (aside from occasionally swooning over their secretary). Speaking of which, Hemsworth is absolutely hilarious in his role as the cute but ditzy secretary, and it’s worth sticking around for a funny sequence during the credits that focuses on him. Although Feig’s Ghostbusters feels like it runs a little bit too long (an unfortunate problem with many of today’s films), it delivers exactly what you would want from the reboot of a beloved movie: lighthearted fun, plenty of nostalgia, and a fresh new cast for a new generation of viewers.